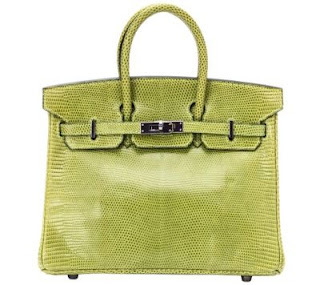 Yesterday SG went to Hermes to check out a red lizard Birkin in 25 cm. I am somewhat surprised it's available at all. For the longest time, Birkin bags are not displayed at all because they are sold even before the shipment comes in. It's the most beautiful red. My gosh, I love it but I just can't justify spending $10,800 right now. Just imagine this Birkin in red and I have it in my hand yesterday. I contact savvy family members immediately to see if anyone wants the red lizard but alas, no taker. Although it's a darling bag, I think it's a little too small. In my opinion, 30 cm Birkin is the perfect size for day or night. Anyway, if anyone is interested call Sam at Hermes South Coast Plaza. He is really nice and informative. As much as I adore Chanel classic flaps, if I am going to spend a lot of money on an exotic bag today, SG will take the Hermes Birkin in 25 cm any day. Yes, materials are different, Chanel is croc and Hermes is lizard and they are both super savvy classics but Hermes for me all the way. This croc retails for $34,500. So savvy people, which do you prefer in the battle of Hermes vs. Chanel (don't take price tags into consideration)? Oooh. Red would be amazing! I'm also a Chanel fan. I see myself using the flap bag (ignoring the Mercedes price tag). Hermes in red? Are you kidding?? Nothing ever can come close to the perfect awesomeness of a red Lizard Birkin. No to Chanel. Oui to Hermes. It's ridiculous anyone would spend this amount of money in the middle of a recession. HERMEs I want to move to the store... just provide me a cable tv & I'm home! Choosing for color, the Hermès. Choosing for material, the Chanel. i agree completely. hermes is so much more classic and beautiful. Hi there-I'm a big fan of the Hermes, they get my vote on this one!! Why can't I have both? Lol. I love the Birkin but you just can't go wrong with a Chanel purse - it makes every outfit instantly classy!